I can say that I'm 99% done my 2 Crazy Quilted Christmas Stockings now. This little Crazy Quilting Mondays in November was exactly what I needed. This week, I had a little visit from my CQ teacher and buddy, Linda H. who gave me some suggestions. I've been eyeballing these every day and it was great to get a fresh set of eyes to point out some areas that could use a little more. It was a great little visit and it got inspired to get moving to get them done (before I forgot what the suggestions were!). So, in addition to adding some double lines of stitching, I added sparkle. 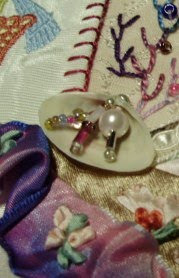 I love how the beads of sparkle give my silk ribbon sprays some glint. 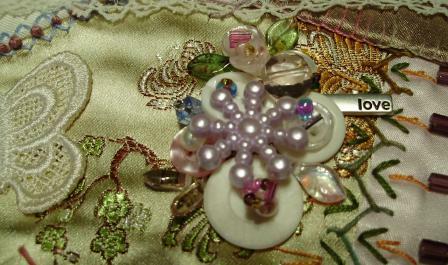 I also added a cluster of buttons and beads to one of the socks for a big hit of whimsy. And I added a shell with some beads. I picked up the shell on a beach last winter. If you look long enough on the beach, you will find perfect little shells that have a small hole in the hinge side of the shell. I'm keeping my eye out for other CQ ideas on how to use these small little shells. I have a couple of small things to do this evening on one of the socks, then I'm going to consider the embellishing done. I do want to put it away for a week, and then look at it one final time before I put the back and lining on. Watch for the final pictures of the entire socks in about two weeks. Maybe my CQ buddy will help me photograph them. You can bet next November, I'll be doing a month of CQ Mondays since I'll be making three Christmas Stockings next year. The Olympic Torch passed through our community this week. It was an exciting event for our family and we loved all the celebrations around it. In preparation for the event, I went shopping for Canada or Olympic clothing to wear along the road and we cheered for our local torch bearers. Many others had thought the same thing, because I was unable to find any touques or mittens. 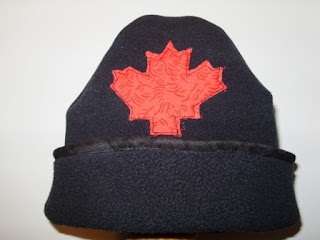 So I decided to make black fleece touques with a Canadian maple leaf, for all of us. 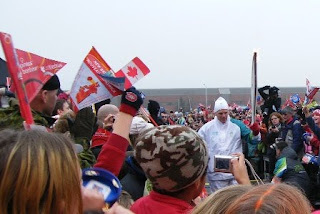 The torch has a long way to go to get to Vancouver yet, so if you are a sewer or quilter and you live west of New Brunswick, why not make Canada Touques for your entire family. Here is my "Sew a Canadian Touque" Tutorial for you. I have incorporated some quilting techniques to give it a special oomph. If you make some touques, be sure to take a picture and blog about it, then leave me a comment. I'd love to see!!! Enjoy the flame Canada. It is awesome to see. 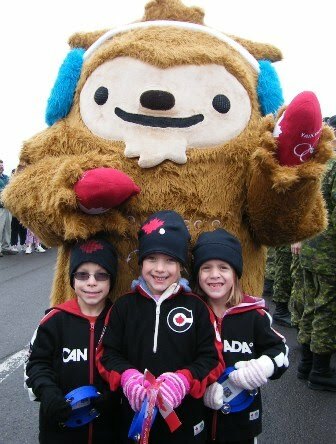 The Make a Canadian Touque and go watch the Olympic Flame when it comes to your community. I'm a quilter, so I've incorporated a couple of quilters techniques to this touque to give it more oomph!.. In particular you'll notice the raw edge appliqued maple leaf. And I've added a cotton binding to the edge of the touque for a finished look. I made both adult and kids sizes, but depending on your fleece, you may have more or less stretch than I had. It's good to make one as a prototype to get the size. I made a couple before I got it right. I hope you enjoy this touque pictorial tutorial. This tutorial is in two parts. 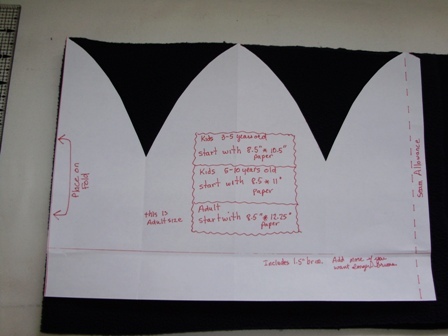 Using standard sheets of paper, you will create your paper pattern template to cut out your fleece. 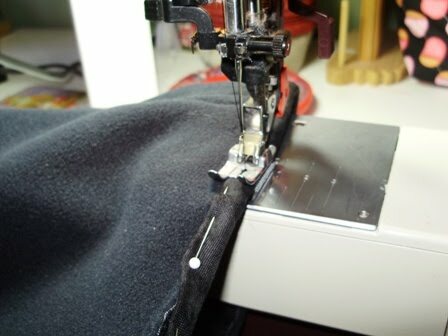 Once your pattern is made, then move to the second part - Sewing a Canadian Touque - Part 2. Next, Fold in on the dashed line. This is your seam allowance. 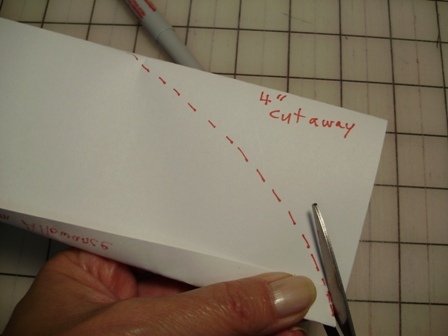 With a pen, make a mark, 4" down from the top, on the double folded side. 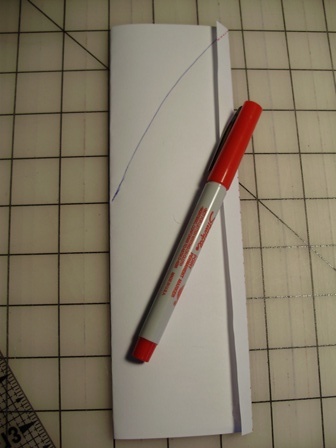 With a slight curved line, join this mark with the top right hand corner, including the seam allowance. Open up your paper, and this will be half of your template. You will cut out the template on folded fabric. 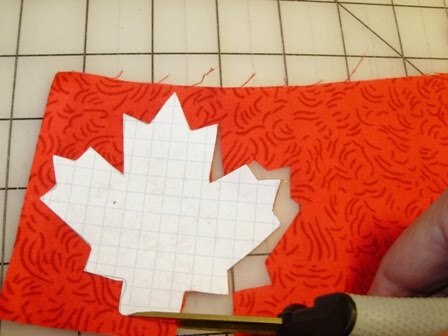 Use a simple maple leaf applique shape to cut out your red applique. You can use my simple maple leaf shape if you like..go here to download. go here to get to the start of this tutorial. Black Fleece: 8.5" x 24.5"
Bias Binding: Approx 30" of 2.25" folded in half. Cut out your fleece. There is a 1.5" brim included but if you would like more of a brim, please add to the bottom. Discard the fleece triangles at the top. Cut out your red maple leaf using this template. I used a 4" square of quilters cotton, but you could use fleece. On the right side of the fleece, center your maple leaf approximately 4" up from the bottom edge and secure with pins or basting spray. 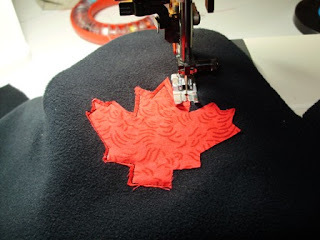 Raw edge applique around the maple leaf wither with a straight stitch or a zig zag stitch, or a buttonhole stitch. It's much easier to do this before you do your side seam. Seam 1: (For the next 4 seams, use a longer stitch length, 3.0 or more). With right sides together, sew the 8.5" side seam with a straight stitch. There is 1/2" seam allowance for this seam. 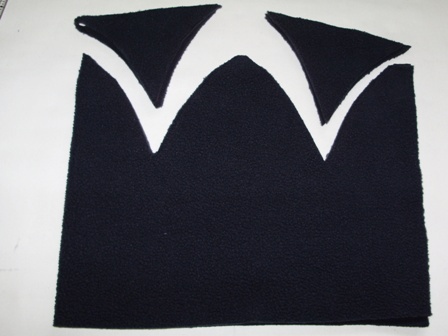 Seam 2 and 3: Fold the touque so that the top points meet. It's hard to see in this photo but your side seam becomes one of your points. Ensure that your side seam is opened. Pin the two outside seams that are indicated by the white pin heads in the photo. 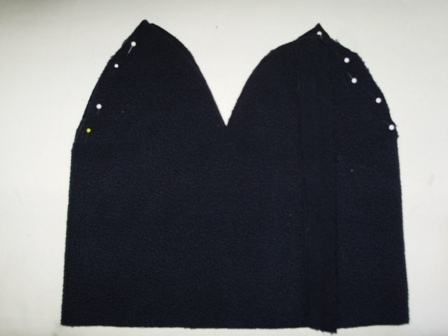 Then sew these seams using approximately 1/4" or slightly larger seam allowance. 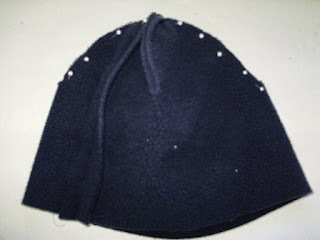 Seam 4: Matching the center seam at the top of the hat, pin the center seam and then pin down each side curve. Sew from the beginning of the curve, over the top, and down the other side of the curve. 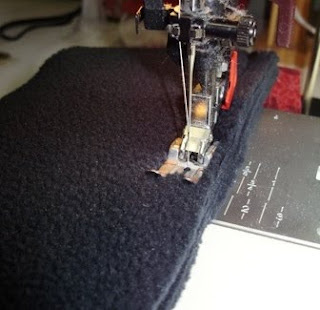 Binding the brim of your touque: Ensuring your side seam allowance is opened, using using your 1/4" foot on your sewing machine, lay the bias binding on the bottom edge of the right side of the touque. Do not stretch either the bias or the fleece. 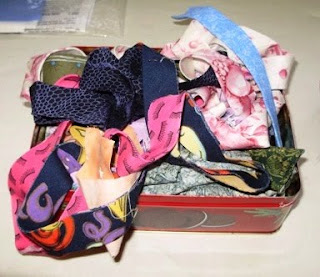 Sew using a scant quarter inch seam, just like you would do for a quilt. Either use the easy fold and tuck joining method, or the diagonal seam to join the ends of your bindng. 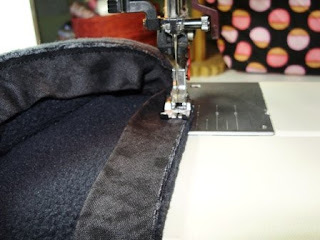 Trim, the bulk away from the side seam allowance/binding seam so that when you do the next fold over step, the fabric folds over to cover the seam. Fold the bias over to the wrong side, covering the original bias stitching seam. Pin frequently with pins pointed toward your presser foot. 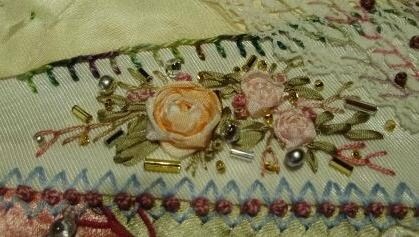 Top stitch down, very close to the binding edge. And that's it. You now have a Canadian Touque. 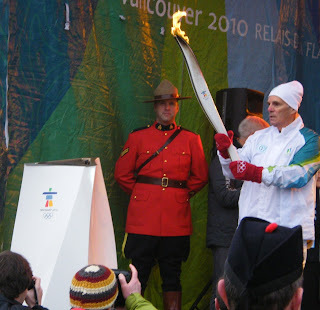 I hope you enjoy watching the Olympic torch go by in your neighbourhood, especially wearing your new Canadian Touque! 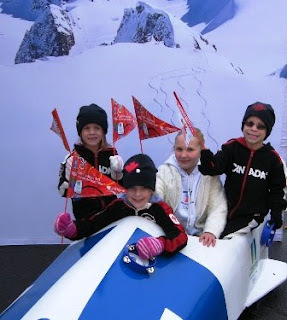 Click here to see a picture of my grandkids with their Canadian touques on. To go to Part 1 of this tutorial, click here. I was reading on Karen's blog, about Quilters Connection, a Canadian Quilt magazine, who are running a contest. Their Spring 2010 issue will be a green issue and they want to know what you do to Re-use, Re-duce and Re-cycle when you quilt. This got me thinking about what I do with my bits and scraps of left over fabric. 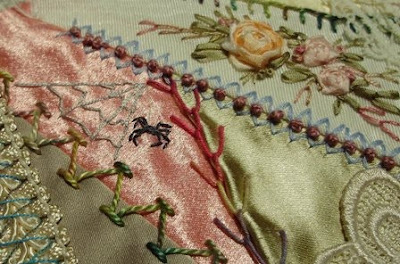 I left comments on the Quilters Connection blog about some of the things that I do and I'll share with you too. 1. When I finish making a quilt, unless there's more than a yard left over, I now cut up the left over fabric into small projects. I have 3 Ziploc bags handy. 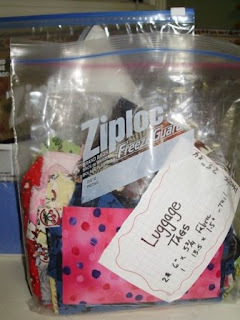 I save 6" x 4" pieces of fabric for making luggage tags. I save 4.5" squares for criss cross Coasters, and I save 5" pieces of fabric for making wonder wallets by Lazy Girl Designs. 2. Binding - a few years back, I ran out of binding for a quilt. I learned a very good lesson, and ever since then, I always err on the high side and usually make too much binding now. Since I always use 2.25" wide binding, I save my leftover binding. When I make a small scrappy project, I put together leftover binging lengths and use it that way. 3. Binding (can you tell I love binding) When I have a fat quarter piece of fabric that is now outdated, or I just don't like it any more, I make standard bias binding out of it. I measure it, fold it up and secure it with a piece of selvage. I put a paper label on it with the length of binding so I can quickly know how much is there to use. I use it to bind small projects. 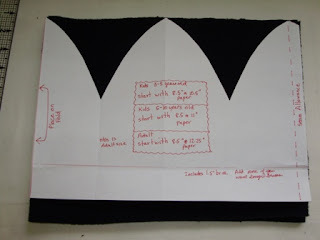 Well, there's my 3 tips for the Quilters Connection blog. If you are Canadian, and and have some green tips, why not go over to their blog and leave your ideas. All tips will be published. Aurora was here for a bit on the weekend. She's now talking up a storm and she's learning her colors and her ABC's. She can almost spell her name by herself. Of course she doesn't really know what the letters mean, she just knows the sequence of letters and is good at repeating the letters. I'm starting to introduce her into my sewing room. 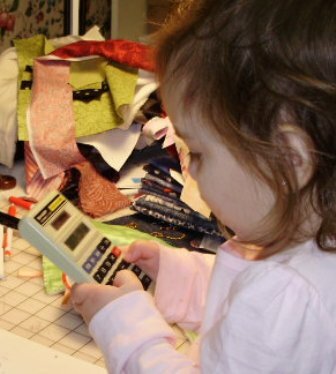 All of the kids love to stand at my cutting table to do crafts. She has always had a particular lik ing for things with buttons. Things like cell phones, remote controls and other things that she's not allowed to play with. When she saw my calculator on my sewing table, she picked it up and she was clicking buttons with both thumbs. I was wondering who she she thinks she might be texting to, on my calculator. She is too cute. Who do you think has the funnier face? We had an awesome afternoon today as we went to see the Olympic Torch celebrations. 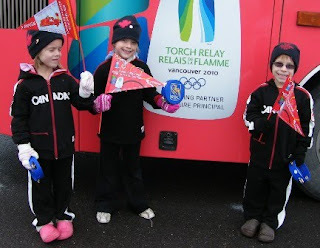 As soon as the bus dropped them off from school, they got dressed in their Olympic outfits. Mama had packed their lunch to eat in the car while we drove to the festivities, so we all piled into the van to drive to Oromocto where the afternoon celebration was. Before the torch came, we visited all the sponsors booths. My friend Linda H. came for a visit earlier today and gave me a really nice tambourine as a noisemaker cause her hubby is working the RBC booth. So as soon as we got to the Celebration site, we looked for the RBC booth and we were lucky to get a tambourine for each of the kids and I get to keep mine. This is the Olympic Mascot. Everyone loves him and he smiles pretty good for the camera, don't you think. We had great front row viewing for an amazing acrobatic performance by the celebration team. 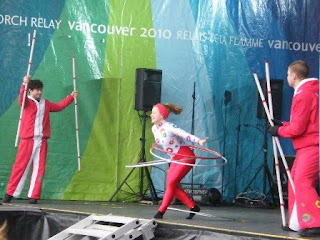 There were also fantastic team of drummers along with a trapeze girl doing really neat things with the hula hoops. Maddison, a long time friend of the triplets was there doing her highland dance on the stage, and she was really happy to meet up with her buddies. /All four fit into this Olympic bobsled just fine. And then it was time. Everyone cheered as the runner was making his way to the stage. What an honor for this retired teacher. After a couple of very short speeches, everyone joined in and sang O Canada with the choir on the stage. I thought this was just so awesome for the kids to be part of. On the drive home, we talked a lot about the Olympics and that they would all be grown up by the time the Olympics come to Canada next. They all said that when the Olympics come again, that they would run with the torch. Now, that they've been to the celebrations, they'll go home and watch Auntie Donna's video of when she carried the torch and they'll enjoy that video of her. It'll be like a then and now story for them. 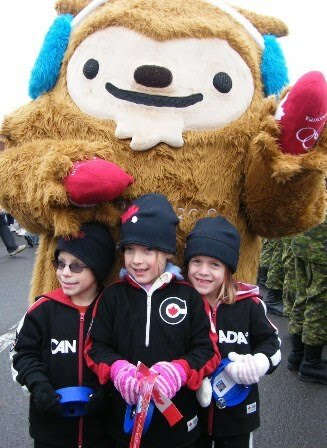 EDIT: Here is a picture of Jessica and Emily at the Olympic celebrations early yesterday morning in Moncton. The runner with the torch ran right in front of the school just before the bell rang. Looks like Emily could use a cup of coffee!!! Ok, I know it's not Monday, but I've been a little behind. I'm sure glad I have this little Monday thing to keep me going. I spent a good part of the weekend installing a new hard drive in my IBM notebook. It's 2.5 years old and it started acting funny, so I called IBM and they had me do a test with a secret key combination and sure enough, there were errors. 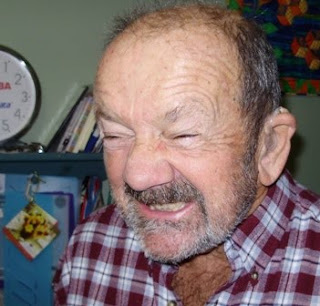 I was lucky that I copied all my data and photos off the computer, but I did have to re-install every program that I was using. I was impressed with IBM though. When I called, there was no press 1 for this, 2 for that. The person who answered, assisted me through my whole ordeal, and was quick to say, I'm sending you a new hard drive and bootable disks. I got them the very next day. I was impressed. Anyway I'm starting to get distracted with other sewing projects and seasonal activities so I'm really glad I gave myself the little Monday challenge to help me get my Crazy Quilted socks done. Last evening, I did manage to get all my buttons out and it's fun making a little cluster. They do take more time that I remember. 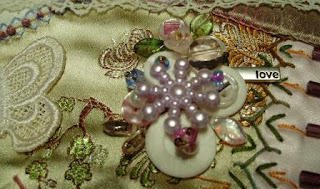 The button cluster and the silk ribbon rose cluster took the entire time that I was watching Dancing with the Stars. I did manage to start applying some buttons to my Christmas Socks but every time I pick up the socks to start to work, I keep saying, oh, that line of stitching could use something else. So I'll be working on it a bit longer than I thought. My friend Linda H. has some spectacular CQ work on her blog. Have a look. She's so good. I know when her students at Quilt Canada take this class, they'll be wowed at her samples. I can't believe it's that time of year again already. It just seems like I finished the Nines and Vines quilt for the St. Dunstan's Quilters, but that was mid-January 2009, some 11 months ago. A few months ago, on a hot sunny day, I visited with the ladies at St. Dunstan's and had a nice cup of tea and a biscuit. I brought books, magazines and snapshots of a dozen quilts that I had pre-selected for them to choose for their 2010 raffle quilt. Just this week, I bought fabric and I'm cutting out a kit for this quilt and will start sewing next week. There are 10 French Country blues that will go with the white background. The blues are mostly from the same collection, so I'm sure they'll look beautiful together in this quilt. It just so happens that my only grandson wants a blue quilt too, so the left over fabric from this quilt will go into his 'Birds in the Air' quilt. This is the quilt I will be sewing. The name of it is Nine Patch and Squares but I can't tell you what book it came from. 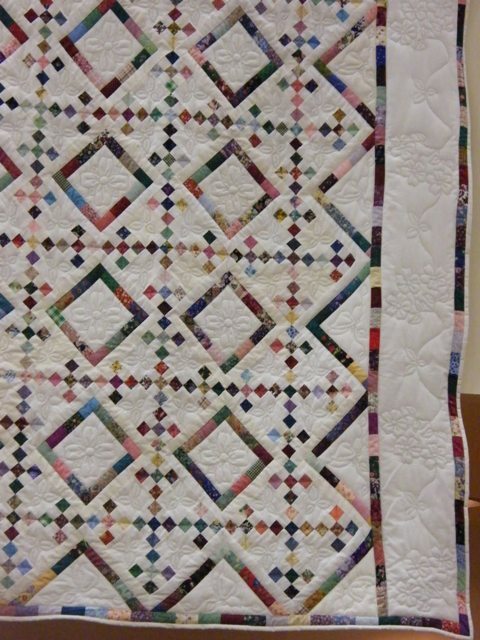 We saw this quilt at a local quilt show and with some rough directions from the quilt maker of this quilt, I'm starting to cut my kit of fabrics. I like the larger white space in the square. This will really show off the fine hand quilting of these ladies. Also the border is room for the stunning rows of their fine stitches. Watch in December for weekly updates on this quilt. I really find that blogging about my progress, helps me to meet deadlines that I set for myself. The Olympic torch is heading our way. It is scheduled to be here in Fredericton next Wednesday, Nov. 25th. Have you happened to read my sister's blog this week?. She ran with the Olympic torch in 1987 and it was quite a moving experience. 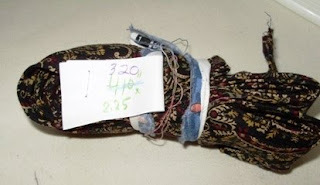 She has lots of mementos from her experience and is blogging about it all week. Reading about all her recollections this week has me all excited for the torch coming through our city. I think I'm going to buy a nice Olympic fleece to wear when I go to watch the torch pass through next week. I would never do a CQ piece without adding the good luck spider. Here are the two spiders spinning their webs on these Christmas socks. 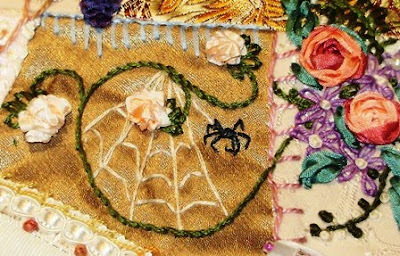 I struggle with stitching the web more than the spider now, so I'll have to work on that. These socks are close to being done and this week, I'll be adding a few button/bead clusters as embellishments. Those are fun to do. 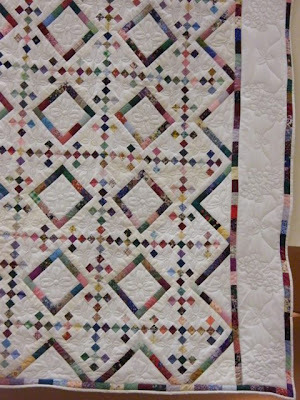 My friend Linda H. got some crazy quilting done this week too. She's going to be teaching this Christmas sock class at Quilt Canada in Calgary next May. I know everyone who is taking this class will be so pleased with what they have learned but will they know the addiction they are getting themselves into. Today I made a 12" quilt block that will find it's way into a quilt that is being made for a colleague that I used to work with on a volunteer board of directors. I was given one small piece of fabric to use in the quilt and then I was to add other fabric and make any block I wanted. That was easy and it's done. I've also been asked to make a 6.5" white, cream, or light NAME block that will be part of the back of this quilt. These quilt blocks along with the name blocks will come from all over Canada. I don't know how these will be stitched into the back of the quilt, but it certainly has peaked my interest. So today, I started thinking more about the Name block than the 12" block. I've never made a name block. Sounds easy, but I thought I'd take the opportunity to use this neat little book that I've had for years. It's a doodle book called the Kids Book of creative Lettering . It's harder than it looks, for me anyway. I think the trick is practice. 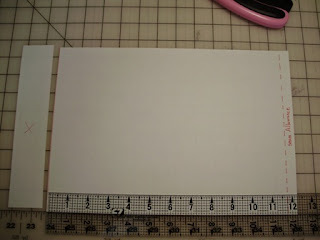 I dig out my 48-pack of Zig markers, ironed a piece of light fabric to freezer paper, measure a 5" square on the fabric with disappearing marker, take a deep breath and then put zig marker to fabric. I use some illustrations and techniques that I find in the book. I'm ok with the little frame that I created and if you stand back 2 or 3 feet, it looks pretty cute, except for the printing of my name. I gave it a quick press, and it looked ok. Just ok. To get rid of the disappearing marker, I rinsed it under the tap, and gave it another press to dry it out. I noticed that some of the ink bled a bit. oh no. I thought Zig markers were colorfast. But it was a good excuse to do another since I wasn't really really happy with it. Maybe a different fabric and a good hot heat set before rinsing it. So I prepared another piece of plain white cotton fabric and drew the frame. I did the name with the thick end of the Zig marker and it was too thick. I'm not happy with this name block either. I did give it a hot hot iron for a good 30 seconds and let it cool, then rinsed it to remove the disappearing marks. It did bleed a bit but not bad. I think in the morning, when fresher (ha ha) I'll try again a third time. One of the three will have to do. It along with the 12" block is going in the mail tomorrow. Also, it's Crazy Quilting Monday today, but my CQ spiders are not done yet. I will expect they'll be done this evening while watching Dancing with the Stars. I'll post about them tomorrow. There's nothing better to a quilter, than a well used quilt. My oldest grandchildren have always had a "blankie". Actually, they are quilts and they have been slept with every night since the girls were one or two years old. These quilts go everywhere with them. Even on vacation! These are well used quilts. This is Jessica and this is her I spy quilt from at least 6 or 7 years ago. It is well worn and very soft. 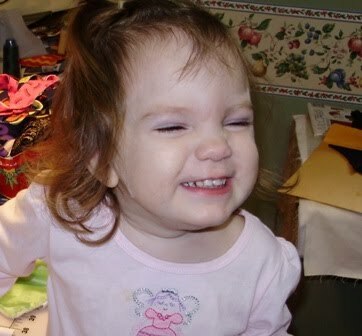 When she was little we used to play I spy with it. She was a smart kid and knew where all the cats, balls, bugs and flowers were. now after years of use, little rips and holes are starting to show up. This quilt has been patched once. Today, while it didn't need a patch, we sewed a beautiful little dragonfly embroidery on it today. It's just sweet and I can guarantee that this quilt is going nowhere except home with Jessica. This is Emily having fun under her blankie. This little quilt was given to Jessica by her other grandmother when she was born. When Emily was a baby, she adopted this little quilt as her own. It's been washed and washed so much that within a few years, holes started to appear. Emily has a great memory and says that the very first patch that we put on the quilt was this little purple cat. When she was a toddler, she was a real cat lover. Then Emily said we put on the poodle patch. She must have been going through her doggie phase. Then we added snowmen, apples, more cats. Then the holes were out of control especially on the back, so the back of the quilt has been completely patched over with large pieces of quilting cottons. It has many many lines of zig zag stitching and is very secure now. So, back to the front, the holes were continuing to come quilting on the front, so I started adding my stitch-out embroidery samples. They were cute too. So Emily has an octopus, a "Bride" patch, a lovely "S" from when I was making Stephanie towels, and even a snake on her blankie. Today, we added a very elegant dragonfly and it's covering a new hole that just came out in the past week. Both of these well used quilts have fun histories and many many memories, for both Jessica and Emily and of course me too!